injury | Live Healthy S.C.
New data from the CDC shows that motor vehicle crash deaths among children are decreasing nationally, but there is still work to do to ensure kids stay safe while riding in cars. 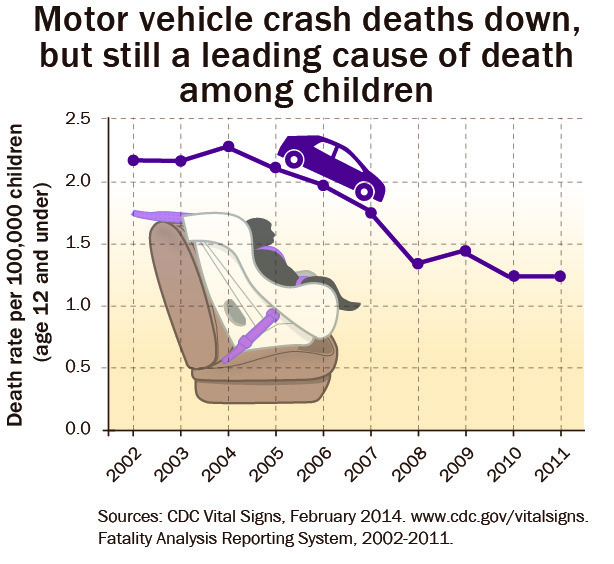 South Carolina is seeing similar declines in motor vehicle fatalities in young children. Preliminary numbers from the S.C. Department of Public Safety show that fatalities in children ages 0 to 12 years dropped from 19 in 2011, to nine in 2013. The diligent work of DHEC’s injury and violence prevention team has helped these numbers go down. Our staff works daily with local and national partners to offer free child safety seat inspections, teach child passenger safety classes in the community, and work with law enforcement to make sure our kids stay safe in moving vehicles. To learn more about the ways we’re working to help more children stay safe while riding in cars, visit our website. Our partners at Buckle Buddies also have some great tips and resources. This entry was posted in Community Health, Prevention and tagged children, injury, prevention, South Carolina, statistics on March 6, 2014 by SC DHEC.